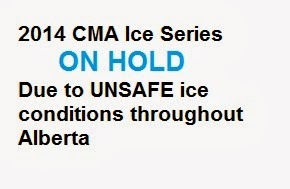 2014 CMA Ice Series is on hold. All races have been cancelled due to the extremely poor ice conditions. 2014 will go into the history books as the first year without ice racing. We have been having a go with Mother Nature for the past few years with challenging ice conditions, rescheduled dates and locations. However, this year, even Lac La Biche is short of ice and having the same issues as the other lakes we normally use. Main issue is the bulk of snow that is weighting down depths of ice ranging from 6" to 14" and insulating the ice preventing thickening. The water is being pushed up through holes and shorelines. The ice that exists is either slushy or filled with snow. Environment Canada has warnings out to all of Alberta to avoid going near any lakes. There have already been cases of snowmobiles and vehicles breaking through. So PLEASE be very cautious! We recommend staying away from the ice, parking the race equipment and heading out to do some snowmobiling, skiing or take the family on a vacation. Thank you to all of our event coordinators that have made numerous trips to the ice to measure thickness, to all of our volunteers that have been standing by, to all of the spectators that enjoy heading to the lake for some family entertainment and cheering! We hope you will all be back for 2015 when we can once again head out for some adrenaline pumping competition! We'll have registration setup as we get closer to the first school/event. Have a great winter everyone and when you figure out what to do with your extra time, let me know otherwise I will be forced to spring cleaning this year....I've managed to put it off for about 10 years!